As I'm pretty sure every DDNet reader knows by now: I like Hatsune Miku. A lot. If Hatsune Miku was somehow a real person I'd be one of those people that would travel overseas just to see her in concert. Heck, with next to no chance that Miku will do a concert in Australia I might well be doing that anyway. You could call my fondness for everything Miku an addiction. It's not just the music either; I like what vocaloids, led by Miku, are doing for the world of music production, because I find it to be so incredibly that an aspiring music producer and/ or artist can effectively have access to a global star for a couple of hundred dollars. It's democratising music production, and that's a good thing. So, after reviewing (and loving) the PlayStation 3 release of Project Diva f 2nd, I was always going to check out the Vita version as well. Miku in my pocket and all that. I'm not going to run through the same notes I made in the PlayStation 3 game review, but I will compare the two versions to hopefully determine which version the less hopelessly addicted Miku fan should go with if they're only going to buy one. The PlayStation Vita version doesn't quite look as good, it must be said from the outset. Though it's still an attractive game, the characters and environments are of a lesser quality; lower resolution, lower detail, the works. It's still a pleasing game on the eyes, but coming straight from the PlayStation 3 game, the downgrade is noticeable. I'm usually not the kind to put great weighting on the technical standard of the visuals, because I do believe that aesthetics and art direction are more important, and Miku certainly ticks those boxes on both PS3 and Vita. 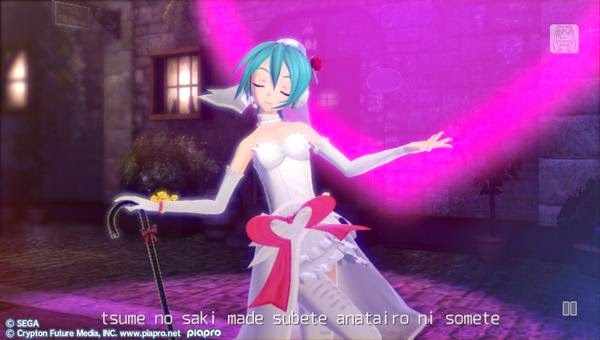 But with Project Diva it is important because the success of the game lies with your attachment to the characters. That's why there's something like $60 worth of costume DLC planned. That's why the developers were able to risk having background video clips so vibrant that they can distract you from the actual play. Heck, the game has a Diva Room feature where the entire point is to hang out with the vocaloids and give them presents, like you would in a dating game. As good as the core gameplay and soundtrack are (and they are good), it's the presence of Miku and her friends that differentiate the game from other rhythm games. And with that in mind the better realised the characters and the higher the definition of the environments, the better. 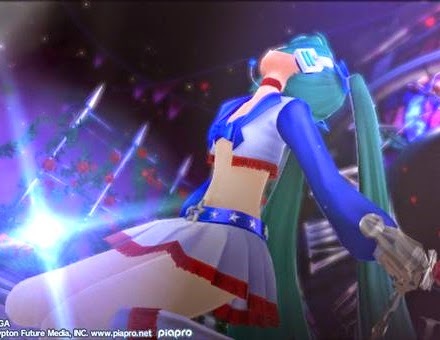 Project Diva f 2nd is still a pretty game, but it's not up to the standard of its console brethren, and I can't imagine that people will be quite as attached to the game to invest in the DLC costumes and the like for this version. On the other hand, the smaller screen size of the PlayStation Vita is actually a benefit to the gameplay. 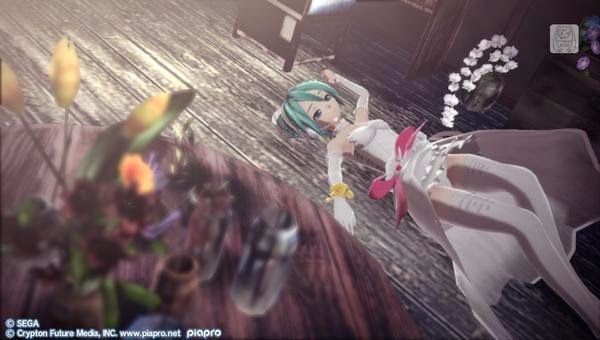 As I mentioned above, the video clips that play in the background during Project Diva's video clips can be distracting. Couple that with gameplay that involved icons popping up all over the screen and only giving you a few beats to hit them to have any hope of earning a large score, and having a large TV where you need to physically search out where the icons are actually adds in a layer of challenge until you've taken the time to memorise the patterns. On the Vita, the screen takes up more of the natural sight range, which makes for a more naturalistic experience. It's still difficult, but it's a less irritating kind of difficulty (I hate games that try and make me memorise patterns rather than rely on skill). There aren't many other differences between the games. Instead of flicking the control sticks to hit some of the notes you'll tap along on the screen, which I personally prefer but it is a matter of personal preference. There's a neat AR feature that allows you to bring Miku into the world to perform a private concert for you (yes, I liked this feature). There's cross-save so people who do own both versions can share the save file between them. Otherwise the songs and costumes remain the same, and it's an extensive catalogue which will last you plenty of time given how long it'll take to even pass, much less master, any track on the extreme difficulty setting. 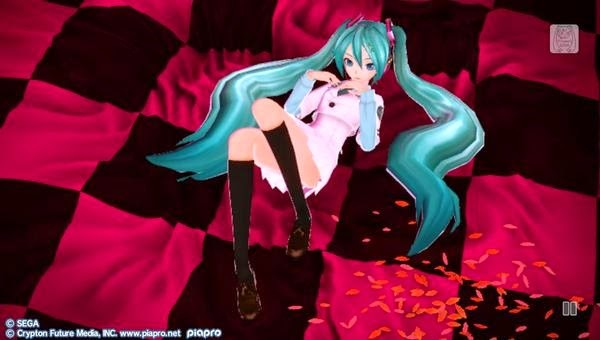 There is also the composition mode, allowing people to create their own Miku videos for their own MP3s, and that's an awesome feature for people that make Miku music themselves. But one last thing to note - just in the PS3 game there is this odd censorship that SEGA has thrown in that blanks out characters when the camera is at certain angles to prevent people getting a look at Miku's (and the other character's) taste in Victoria's Secret. Weirdly though in the video clips themselves there's no silhouetting and plenty of the clips give players a peek anyway. Beyond that certain costumes are more than a little fanservicey from the outset, and there's supposedly swimwear DLC on the way for all characters. The censorship in this context is weird, and actually serves to make the fanservice side of the game more creepy, since it actively draws attention to it. I'm all for the intent of the developers behind the censorship - to preserve the integrity of the Miku brand - but it only works if there's consistency. Which in this game there is not. As a side note - now that Miku has opened a Lady Gaga concert and performed on Letterman, clearly the next step is for her in her rise to the top of international idoldom is to appear in the Victoria's Secret Fashion Show. Time to start the online petition, methinks. But I digress. I really do hope this game sells enough in the west for Sega to produce one for the PlayStation 4, and then localise it in the west. Miku with that much horsepower behind her would be something special to behold and rhythm games on big consoles are a dying breed. In the meantime, I can't really complain about a portable version of the game that won the award for best soundtrack in our 2014 awards. Item Reviewed: Review: Hatsune Miku: Project Diva f 2nd (Sony PlayStation Vita) 9 out of 10 based on 10 ratings. 9 user reviews.